This page contains new printer drivers for WordPerfect for DOS 5.1 and 5.1+. If you are looking for printer drivers for WordPerfect for DOS 6.0, 6.1, or 6.2, go the 6.x printer drivers page. If your printer was originally made before around 1996, you may be able to find a driver for it on Corel's driver download page. Go to the page; find your printer; download the self-extracting driver file. (1) Search this page to see if your printer is supported by a driver on this page. Use Ctrl-F and search for the number (only) in the name of your printer. For example, if you have an HP LaserJet P2055dn, search for "2055" (no quotation marks) and make sure that you find a printer name that closely matches your own. For example, if your printer is the HP LaserJet P2055dn, you will find the close match "HP LaserJet P2055 series". (3) If you have found a driver for your printer on this page, then do the following. 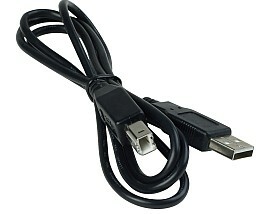 If (and only if) your printer is connected to your computer by a traditional parallel cable (which looks like this), proceed to step (4). If your printer is connected to your computer by a USB cable (which looks like this) or by a network connection, then proceed to another page and set up your computer so that WordPerfect for DOS can print to your printer; then (and only then) proceed to step (4). (4) Download and install the driver for your printer, as described elsewhere on this page. Please read the general notes on these drivers and the frequently-asked questions and the advice on which printer to buy before you do anything else! Don't ignore this paragraph! If you don't know how to download and install a printer driver, read the instructions. Important warning: I cannot guarantee that these drivers will work with your specific printer! In almost all cases, I have prepared the driver on the basis of information posted on a manufacturer's web site. That information may be mistaken, or refer to printers manufactured at an earlier time. If you buy a printer only because it is listed on this page, be prepared to return it if necessary. I believe that these drivers work, but I have no means of testing them with all the printers listed on this page. These drivers also work with these other products in the WordPerfect 5.1 family: DrawPerfect 1.x, LetterPerfect 1.0, PlanPerfect 5.1, and WordPerfect Works 1.0. For drivers for WPDOS 5.0, consult this list of drivers available on Corel's web site. Consult the list of printers for the name of the file that contains the driver you want, and download the driver from the WPDOS 5.0 FTP directory on Corel's web site. For WPDOS 4.2, download drivers from the WPDOS 4.2 directory on Corel's web site. Please leave feedback if these drivers need any corrections. For example, if you find that you need to press the manual feed button when printing, please let me know your exact printer model and the driver that you are using; I can make a correction in the driver to solve the problem. Slight errors in page margins (which may be a few millimeters away from their correct position) are also easy to fix, but only if you send me full details. When writing, please include your WPDOS version (5.1, 6.0, 6.1, 6.2), and the full name of your printer (for example, HP DeskJet 990cse), not just the number ("HP 1100" can mean any of four completely different printers; I cannot help unless you include the full name). If your old documents do not print correctly after you install the driver for your new printer, that may be because, by default, when you open an old document, WordPerfect temporarily switches to the printer driver that was current when you last saved the document. Either use Shift-F7, Select, and switch to your new driver, or avoid the problem entirely by using Shift-F1, Initial Settings, and switch the setting named Format Retrieved Documents for Default Printer from No to Yes. If you can't choose the paper-size definition that you used before you installed this driver, see this site's instructions for creating paper-size definitions in WPDOS. If you can't make the printer draw paper from the correct input bin (for example, the lower tray on an HP LaserJet), make sure that you selected the correct Sheet Feeder definition, using Shift-F7, Select, Edit. Sheet Feeder. The correct sheet feeder definition will normally have a model number similar to that of your printer (for example, for the HP LaserJet 5100, use the HP LaserJet 5000 sheet feeder definition). You may need to experiment with different sheet feeder definitions until you find one that works perfectly. If you are experiencing problems printing under Windows, or you want to print to a USB printer for which you have a WPDOS driver (either from this site or from Corel), see the suggestions on this site's Windows printing page. If you have a PostScript printer for which no specific WPDOS driver exists, you can probably use almost any standard PostScript driver. For monochrome printing, the Apple LaserWriter IINTX is always a safe choice; the Xerox DocuTech 135 driver gives access to a wide range of sheet sizes. For color printing, try the Tektronix Phaser ColorQuick driver. These drivers may be downloaded from Corel's driver download page; search for the printers by name. For PostScript Level 3 printers, try the generic drivers available from this page. If you cannot find any driver that works with your printer, see this site's instructions for printing from WPDOS to any Windows printer. A full list of older WordPerfect printer drivers available from Corel's driver download page may be found in this self-extracting printer list archive from Corel's web site. A list of supported soft fonts may be found in another self-extracting font list archive from the same site. If you get error messages when you try to download files from Corel's driver download page, see this site's troubleshooting guide for Corel downloads. Q. I can't find any driver on this page for the new Samsung (or Brother or Canon or Dell or Kyocera or Lexmark or something else) laser printer that I'm interested in buying. Can you tell me whether that printer works with one of your drivers? A. I can't tell you, because I don't know. But you can very easily find out for yourself. Go to the manufacturer's web site, and look for the technical specifications of the printer. Look for a category with a name like "emulations" or "printer languages" or something similar. If you see either the words "PCL5" or "PCL5e," then the printer has a good chance of working with my drivers for the HP LaserJet 2400 or 4100 series. (Warning: If you see "PCL6" but you do not see "PCL5e," then the printer may or may not include PCL5e support and may or may not work with my drivers. Some PCL6 printers also have PCL5e support, but not all.) If you see the word "PostScript," then simply use the driver that came with your WP program for the "Apple LaserWriter IINTX" (use the "Additional Printers" item on the printer selection menu in WP). If you see the words "PCL5c," then the printer is a color printer that has a good chance of working with my drivers for HP Color LaserJets. But remember that there are no guarantees! The manufacturer's web site and specifications may be misleading or mistaken, or the printer may not work for any other reason. Remember: If you do not see either "PCL5" or "PCL5e" or "PCL5c" or "PostScript" listed, then do not buy the printer! If the specifications say "PCL4," but not "PCL5" or "PCL5e" or "PCL5c," then do not buy the printer! If the specifications say that PCL is supported only under Windows, then do not buy the printer! Please do not write to ask me about any printer that is not explicitly listed on this page. Q. Before I saw your printer recommendations on this page (or: after I studied your recommendations and decided to ignore them) I bought a low-priced Brother printer, or some other very inexpensive model, and now I can't print from WordPerfect for DOS. I'm desperate. What should I do? A. You have two options. Either (1) take the printer back to the shop and exchange it for one of the Hewlett Packard models that are listed on this page; or (2) devote vast amounts of time and effort to making the printer work with this site's slow workaround methods of printing to any Windows printer. I strongly recommend option (1) over option (2). Q. All of my work and much of my life depends on my ability to print from WordPerfect, but I'm just too lazy to read all the carefully-arranged and clearly-explained information that you've put into this page. Also, I'm too selfish to spend my own time solving my own problems and I'm too passive to make any attempt to understand written information that's longer than a headline. Furthermore, I really like it when other people pay a lot of attention to me. So would you please just send me an e-mail telling me what printer to buy? Please do it right now. A. It's never too late to learn to be self-reliant. Q. I bought a low-priced printer that was described as "PCL4 compatible." I thought that meant the printer was compatible with the my old HP LaserJet, but the only font I can use is 10-pitch Courier. How can I print with the same fonts I used before? A. You can't. "PCL4" is the printer control language used in the ancient HP LaserJet Series II, which contains only one useful font, 10-pitch Courier. You have two options. Either (1) take the printer back to the shop and exchange it for one of the Hewlett Packard models that are listed on this page, almost all of which support PCL5e; or (2) devote vast amounts of time and effort to making the printer work with this site's slow workaround methods of printing to any Windows printer. I strongly recommend option (1) over option (2). Q. I studied your recommendations with great care; I bought a printer that you recommend and for which you supply a driver; and I followed your instructions in exact detail. But my new printer won't print, or it causes weird errors when I try to print. A. See the troubleshooting advice elsewhere on this site. Q. I followed your instructions exactly, and installed your driver exactly as you told me to. But when I press Shift-F7 in WordPerfect, and look at the list of Additional Printers, I don't see my printer on the list, even though your description of the driver says that it's included in the driver. Are you totally incompetent? What's wrong with you? A. Don't be clueless! Press the PgDn key to see more printers than WordPerfect can list on one screen. Or type N, and then (without pressing Enter) type the exact name of your printer; WordPerfect will try to find its name as you type. Q. 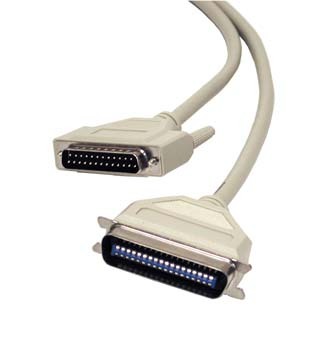 My printer uses a parallel cable to connect to the computer, but my new computer does not have a parallel port. What can I do? A. Either return your new computer and get a better one, or follow the instructions elsewhere on this site. Q. I've been using the "Standard Printer" driver that comes with WPDOS, and now I've switched to one of your drivers. I use the same typeface that I used before, but the margins and layout of my printed pages are different. Why? A. That is exactly what is supposed to happen. The "Standard Printer" driver is absolutely minimal in function; my drivers and the original WP Corp. drivers will always produce results slightly different from those produced by the "Standard Printer" driver. Q. I installed one of your drivers, and now I can't find the paper-size definition that I used with my earlier driver. A. You will need to create one or more new paper-size definitions to use with the new driver. This is the way WordPerfect is designed to work whenever you install a new printer driver. Please do not write to me to complain that this is inconvenient and time-wasting and I should not have allowed it to happen; find the original WordPerfect programmers and complain to them. If you are choosing a laser printer for use with WPDOS 6.x, I strongly recommend that you buy a Hewlett Packard LaserJet, or an HP-compatible laser printer that supports the PCL5, PCL5e, or PCL5c printer control language (these include many, but absolutely not all, Lexmark, Canon, Samsung, and Minolta-QMS laser printers; but you should study the note on Dark Courier immediately below this paragraph), or that you buy a PostScript printer. Many Hewlett Packard, Lexmark, and Canon laser printers support PostScript in addition to the HP PCL5e standard. Note: If you intend to use the Courier typeface, buy only a true Hewlett-Packard LaserJet, not an HP-compatible model from another manufacturer. Hewlett-Packard laser printers can be set to print in "Dark Courier" instead of a thin, spindly Courier; apparently, other printer vendors do not provide this option. I recommend almost any medium- or high-priced Hewlett Packard LaserJet printer, but not the HP printers listed in various sections below under a "Do not buy" heading. All the "Do not buy" printers require complicated workarounds when printing from DOS applications. Be very careful when buying an HP multifunction printer (such as the M1319), because most models require the same complicated workarounds. Drivers for HP and HP-compatible printers may be found on this page. For basic monochrome laser printing from WPDOS, any printer in the HP LaserJet P3xxx series will probably be ideal, and any higher-priced printer model is highly recommended. Some less-expensive models in the P2xxx series will work well, but you must study the list of supported models (elsewhere on this page) with great care. Most current models numbered 2300 and higher either support automatic duplex (two-sided) printing when first installed, or can be fitted with a device that supports automatic duplex printing. No current LaserJet model ships with a parallel port; some high-end models can be fitted with a parallel port, but you no longer need a parallel port anyway. Instead, use the DOSPrint method described on another page to print from WPDOS to those printers. Never buy the least expensive laser printer in any manufacturer's product line unless you are absolutely certain that the printer is fully compatible with one or more of the following standards: PCL5, PCL5e, PCL5c, or PostScript. (PCL4 is not enough.) If you ignore this advice, and if you insist on buying a printer that is not fully compatible with one or more of those standards, you will almost certainly need to use one of this site's slow and extremely complicated workarounds if you want to print from WordPerfect for DOS. Note: Do not buy the Brother HL-1230, HL-1240, HL-1430, HL-1440, HL-2040, HL-5130, Lexmark E210, or any other extremely inexpensive (i.e. less than about US$250) laser printer for use with WPDOS. If you insist on buying these printers, you will not be able to use any font other than Courier when printing from WPDOS 5.1, except when using one of the slow and extremely complicated workarounds that are described elsewhere on this site. Please save yourself trouble and aggravation by buying an HP LaserJet instead (but only if you see the specific model listed on this page). Also, do not buy the Minolta-QMS Magicolor 2200 or 2300 models (the 2350 and higher-numbered models should work well with WPDOS). If you are choosing an inkjet printer for use with WPDOS 5.1, I very strongly recommend that you buy a high-end Hewlett Packard OfficeJet Printer, because many of these printers (with some exceptions noted below) support text printing from DOS applications like WordPerfect. Drivers for many high-end OfficeJet models may be found on this page, together with drivers for obsolete DeskJet, Business Inkjet, Color Inkjet, and Photosmart models that were usable with WPDOS. Some high-end HP inkjet models include PostScript support, in a few cases as an optional add-on; you will need to study HP's web site to determine which ones support PostScript. I strongly recommend that you do not buy recent inkjet models from Lexmark or Canon, as these are almost unusable with WPDOS 5.1. Some or all current Epson Stylus and Photo printers apparently have the same limitations. Warning: Use these drivers only with printers that use Adobe PostScript Level 3; do not use them with printers that are described as "PostScript Level 3 compatible" or some similar phrase (for non-Adobe PostScript Level 3 printers, use one of the original PostScript printer drivers that ship with WPDOS, perhaps Apple LaserWriter II NTX). If you use these drivers with any PostScript Level 3 printer that is not explicitly described as using Adobe PostScript, your documents may print with the wrong fonts, or only with a generic Courier font. In WordPerfect's list of Additional Printers, these drivers are listed as PostScript Level 3 Printers (color) and PostScript Level 3 Printers (mono). Different PostScript printers use different codes for controlling their sheet feeders. These drivers include all known WPDOS 5.1 PostScript sheet feeder definitions. You should experiment to find one that works with your printer; if you find a sheet feeder definition that works well with any current printer, please send me feedback. Notes: Popular printers that support the PostScript Level 3 font set include the HP Color LaserJet 2550, 3700, 4650, 8500 and 8550, the Lexmark Optra C, T, and W series, and the Xerox Phaser 850, 860, and other recent models. All these printers may also be used with the HP LaserJet 4000 series drivers or (for color printers) with the HP Color LaserJet drivers, elsewhere on this page. Note: WPDOS 5.1 drivers for the HP LaserJet 6L, 6M, 6MP, and for other older models used with euro-enabled soft fonts or SIMMs may be found in a separate self-extracting archive (WP51HPL6.EXE). If you need to update a WPDOS printer driver: First install the .ALL file as explained here, then, in WPDOS, use Shift-F7, S - Select Printer, 7 - Update. If you get a message saying that the .ALL file cannot be found, then delete the printer and install it again from the list of Additional Printers. Supported printer families supported by the drivers in the WP51HPLJ.ZIP archive are listed below. (Updated 9 February 2017 to correct an error that printed an initial blank page in some circumstances.) Note that a LaserJet "series" includes all models that begin with the listed number, so that the "HP LaserJet 4200 series" includes the LaserJet 4200n, 4200tn, 4200dtn, 4200dtns, 4200dtnsl, etc. Please do not ask me for drivers for earlier models such as the HP LaserJet Series II, III, 4, and 5; those drivers may be found on your original WP printer disks and may also be downloaded from Corel's printer driver page. If you need a driver for a recent HP Color LaserJet (4500, 8500, etc. ), see the separate set of Color LaserJet drivers elsewhere on this page. Multifunction printers: I do not know whether these drivers will work with HP multifunction laser printers such as the HP LaserJet 3015, 3020, 3027, 3050 3055, M1522, M2727, M3025, M3027, or 3200); possibly they will work, and possibly either a PostScript or PCL printer driver may work with some or most of these models. One way to find out whether these printers will work smoothly with WordPerfect is to follow the instructions in the first of the frequently-asked questions on this page. HP LaserJet P2015 (PCL): Prints in Courier only, unless you install a special font DIMM for the HP LaserJet P2015, available from HP as part number HG285GS (search for the part number on the HP site); after installing the font DIMM, use the driver listed above for the HP LaserJet 1300 series (PCL). Note that some printers in the P2015 series may have this font DIMM already installed. Older HP printers can print the euro symbol only through the use of hardware and software add-ons. HP supplied SIMM and DIMM hardware add-ons that add support for the euro symbol for some printers models that do not have the euro built in. The driver file available a few paragraphs above contains a generic driver ("HP LJ 4/5/6 w/Euro SIMM/DIMM") for use with any of these earlier models that have the HP euro SIMM or DIMM installed. HP also supplies bitmap and scalable soft fonts that contain the euro symbol, and which may be used with printers that lack built-in euro support (see details on this site's euro page). The driver file contains a generic driver ("HP LJ Basic w/Euro Soft Fonts") that will download and support these soft fonts if you have them on your disk. Alternatively, if you don't mind a less-than-perfect euro symbol, you can use this site's special LaserJet drivers that "draw" the euro symbol using built-in LaserJet graphic commands. The original WPDOS 5.1 drivers for HP LaserJet models released before mid-1996 (available on Corel's web site) do not support all the fonts and sheet feeder options available with newer LaserJet models, although the older drivers are generally compatible with these printers. If you are nervous about using the drivers on this site, try Corel's site first. If you prefer the "dark Courier" from older HP LaserJet models to the "light Courier" built into recent models, see the instructions elsewhere on this page that will make recent HP LaserJets print in dark Courier. If, and only if, you use a non-Windows operating system (like NetWare over DOS), and if, and only if, a page of nonsense characters like "12345-X" is printed at the end of your WPDOS print jobs, download and install the printer drivers in this self-extracting archive (WP51LJNW.EXE) (79KB; updated 6 November 2003). It contains drivers named "HP LaserJet 4x00 (PCL) NO PJL" (for the HP LaserJet 4000, 4100, 4200, 4300, etc.) and "HP LaserJet 8x00 (PCL) NO PJL)" (for the HP LaserJet 8000, 8100, etc.). Important note on printers that use a network connection or USB cable instead of a parallel cable: If your printer is connected by a network connection or USB cable instead of a traditional parallel cable, you will also need this site's method of printing to USB and network printers. Some of these printers use a software workaround to print from DOS applications that are run from inside a Windows DOS box or from full-screen DOS under Windows. They will not print if you exit Windows to MS-DOS, and work only with Windows 98, Me, 2000, and XP (not Windows 95 or NT). When printing from WPDOS, you may find that extra pages with nonsense characters are printed at the end of every print job. You may need to use this site's methods of printing to any Windows printer if you want to use these printers with WPDOS. If you use the PostScript mode available (in some cases as an optional add-on) with the HP LaserJet 6M, 1200, 1300, 2100, 2200, P2050 (and P2055) P3005, M3025, M3027, 3050, 3300, 4000, 4050, 4100, 4200, 4300, M4345,P3005, P3015, P4010, P4410, M5025, M5035, 5100, 5200, 8000, 8100, or 9000 series, or the HP Color LaserJet CP1218, 2500, 2550, 2605, 3700, 4500, 4600, or 4650 series, you may download a self-extracting archive (WP51PS4K.EXE) (58 KB; updated 24 October 2010) containing generic drivers for these printers. All 80 internal fonts are supported in the drivers for the models that include 80 fonts (the standard PostScript 35 plus 45 additional fonts from HP); the official Corel and HP drivers for earlier HP PostScript printers support only the standard 35 PostScript fonts. These drivers will probably work with some but not all HP all-in-one (print-scan-copy) multifunction LaserJet printers. Try the driver for "HP LaserJet 6MP PostScript", which is most likely to work most smoothly with such printers. These drivers are experimental; if you encounter any problems with them, please contact me. When writing, please include your WPDOS version (5.1, 6.0, 6.1, 6.2), and the full name of your printer (for example, HP DeskJet 990cse), not just the number ("HP 1000" can mean three different printers; I cannot help unless you include the full name). The HP Business Inkjet 2200 printer probably requires this site's methods of printing to any Windows printer; if the optional PCL5 and PostScript card is added, use the HP Business Inkjet 2250 (PCL) driver or a color PostScript driver. The HP Business Inkjet 2230 is supported by the HP DeskJet driver elsewhere on this page; if the optional PCL5 and PostScript card is added, use the HP Business Inkjet 2250 (PCL) driver or a color PostScript driver. The HP Color LaserJet 2550 and 2605 require the PostScript Level 3 driver available elsewhere on this page. The only practical way to print to these printers from WPDOS is this site's methods of printing to any Windows printer. Please contact me if you have any problems with these drivers. When writing, please include your WPDOS version (5.1, 6.0, 6.1, 6.2), and the full name of your printer (for example, HP DeskJet 990cse), not just the number ("HP 1000" can mean three different printers; I cannot help unless you include the full name). Important note on printers that use a network connection or USB cable instead of a parallel cable: If your printer is connected by a network connection or USB cable instead of a traditional parallel cable, you will also need this site's methods of printing to USB and network printers. Important: If you want to print envelopes with DeskJet 9xx and later models, see the note on envelopes below. Note: The HP Business Inkjet printers (other than the 2230) are supported by the HP Color LaserJet drivers elsewhere on this page. For the HP DeskJet 510, use the HP DeskJet 520 driver downloadable from Corel's web site (search for "HP DeskJet 520"). For the HP OfficeJet 600 and 700 series, try the HP DeskJet 690 series drivers, but I cannot guarantee results for these models. For the HP PSC-370 and PSC-380, try the PSC-500 drivers. Most HP inkjet printers output pages with the printed side facing up; as a result, the first page is at the bottom of the output stack, and multipage print jobs must be reordered by hand. This site provides a WPDOS 5.1 macro to print pages in the reverse order, so that they do not need to be resorted into the correct page order. Note: When printing envelopes with these drivers, you must insert the envelope with the flap on the right, even if the diagram on the printer tray tells you to place the flap on the left. To avoid problems when printing envelopes with the HP DeskJet 9xx series, tuck the flap into the envelope before printing, then remove the flap after printing. Some HP inkjet printers support duplexing when used with Windows; it is unfortunately not possible for WordPerfect drivers to use duplexing with HP inkjets. Models with numbers slightly higher than the numbers listed here are supported by the models with next lowest number. For example, the HP DeskJet 882 is supported by the HP DeskJet 880 driver, the HP DeskJet 855 series uses the HP DeskJet 850 driver, and the HP DeskJet 952 uses the HP DeskJet 950 driver. The exception is the HP DeskJet 895, which uses different drivers from those of the HP DeskJet 890 because the two printers have different fonts in their firmware. The original drivers for the HP DeskJet 600, 660, and 850 series are also available on Corel's web site, but the new drivers on this site correct minor errors in the originals. DeskJet models with the euro symbol in firmware are supported; DeskJet models that accept downloadable soft fonts include support for the HP EuroSign soft fonts. See this site's euro page for instructions on using the euro symbol. Other solutions may be found on the same page for using the euro symbol with any printer. The only practical ways to print to these printer from WPDOS are through one this site's methods of printing to any Windows printer. Please note that these are the first versions of these drivers. Please contact me with reports of any problems. When writing, please include your WPDOS version (5.1, 6.0, 6.1, 6.2), and the full name of your printer (for example, HP DeskJet 990cse), not just the number ("HP 1000" can mean three different printers; I cannot help unless you include the full name). The Lexmark E120n and E210 printers are apparently Windows-only printers, and requires this site's methods of printing to any Windows printer . Note that PCL support in these drivers is limited to 600 dpi, even with 1200 dpi printers, because the PCL5 language, which is the language used by WordPerfect LaserJet drivers, only supports 600 dpi output. PCL6, which supports 1200 dpi graphics, is available only with Windows and Ghostscript. PostScript support in these drivers, however, includes 1200 dpi text and graphics in all printers that can print at that resolution. For recent Lexmark, NEC, QMS, Xerox and other laser printers that support PostScript Level 3, use the PostScript Level 3 drivers elsewhere on this page. Brother. The Netherlands office of Brother International created WPDOS 5.1 drivers for a wide range of older Brother inkjet and laser printers. After downloading the self-extracting file, run the file in a temporary directory, then run the extracted WP51ALL.EXE file to extract the .ALL files that contain the printer drivers; copy the .ALL files to your WP printer file directory (to find out what this directory is, use Shift-F1, Location of Files). Most Brother Multifunction Devices, such as the MFC-4450, are "Windows-only" printers; however, you may be able to print to them from WPDOS, but only when running WPDOS under Windows, and only by selecting the HP LaserJet Series II printer driver that is included with WPDOS. This driver only lets you print in the Courier typeface only. If you want to use any other fonts (for example, Times) when printing from WPDOS to these devices, you must use this site's methods for printing to any Windows printer. HL-1030, HL-1230, HL-1430, HL-1435, HL-2040, HL-2140, HL-5130: Do not buy these printers; they require this site's methods of printing to any Windows printer. However, a user reports success with the HL-2040 by using the original WP driver for the HP LaserJet III under Windows XP with the Brother-supplied Windows printer driver installed. HL-1250, 1450, 1470, 2460, 5040, 5050, 5140 (but not the 5130): Emulates the HP LaserJet 6P (use the HP LaserJet 6P-compatible (with euro) driver elsewhere on this page). HL-1850, HL-1870, HL-2070, HL-2170, HL-5150, HL-5170, HL-5240, HL-5250, HL-5280, and probably any higher number monochrome printer: Largely emulates the HP LaserJet 4100 series (PCL) (use the driver elsewhere on this page) or (except for HL-2070) use the PostScript Level 3 driver elsewhere on this page. Please send feedback on any problems. Note that the following Brother printers are also compatible with any standard PostScript driver: HL-1450, 1470, 1650, 1670, 2460, 2060, 2460, 5050, 5070, 6050, 7050, HS-5300 (with optional BR-Script 2 ROM add-in board). Canon. Many, but not all, Canon laser printers, and some Canon multifunction laser printers, are highly compatible with Hewlett Packard printers, and, in many cases, include PostScript support; they may be used with the HP drivers found elsewhere on this page. (Two Canon laser printers that are not compatible with HP or PostScript printers are the Canon LBP 800 and LBP 810; these require this site's method of printing to any Windows printer.) Note: Many recent Canon bubble-jet models probably cannot be used directly by WPDOS 5.1, because WPDOS 5.1 does not have a graphics output mode like that of WPDOS 6.x. To print from WPDOS 5.1 to these printers, use this site's method for printing to any Windows printer. Epson. I do not know of any WPDOS drivers for recent Epson inkjet printers, but Epson publishes full documentation of its printer command language (the linked file is part 1 of the documentation; for the rest, replace "part1.pdf" in the link with "part2.pdf" through "part6.pdf") and interested users may be able to modify existing Epson drivers. (The Epson Stylus 800 driver available on Corel's driver download page may work with the Epson Stylus 880, 980, and C80 models, but probably not with other models.) If you have Epson StylusRIP PostScript software for Epson inkjet printers, you may be able to print from WordPerfect to these printers by using the freeware PrintFile utility to redirect output from WPDOS (using a PostScript printer driver) to the StylusRIP software, but I have not tested this. Lexmark. Some of Lexmark's recent laser printers are supported in drivers elsewhere on this page. Recent Lexmark inkjet models (Z12, Z22, Z32, Z42, Z52, Z53, Z73, and later) are probably usable only with this site's methods of printing to any Windows printer. According to Lexmark's web site, some older Lexmark inkjet models (1000 through 7200, Z11, Z31, Z51, and WinWriter 150C) can be run from inside a Windows DOS box if you set up your DOS application to use a driver for the HP DeskJet 500 or 500C; with WPDOS 5.1, this limits you to printing in Courier, so you may prefer to try this site's method of printing to any Windows printer. For recent Lexmark laser printers that support PostScript Level 3, use the PostScript Level 3 drivers elsewhere on this page. Minolta-QMS. The Minolta-QMS PagePro 1100 laser printer may be used with the original WPDOS driver for the HP LaserJet 4. The Minolta-QMS Magicolor 2200 and 2300 require this site's method of printing to any Windows printer, but the Minolta-QMS Magicolor 2350 and higher-numbered models should work well with any of the color PostScript drivers that come with your original WPDOS disks (for good results, try the Tektronix Phaser ColorQuick driver, which may be downloaded from Corel's driver download page by searching for the Tektronix printer by name) and may also work with this site's HP Color LaserJet drivers (try the HP Color LaserJet 4600 driver). For recent QMS laser printers that support PostScript Level 3, use the PostScript Level 3 drivers elsewhere on this page. NEC. Many NEC SuperScript inkjet and laser printers can be used with WordPerfect drivers for HP DeskJet and LaserJet models. For recent NEC laser printers that support PostScript Level 3, use the PostScript Level 3 drivers elsewhere on this page. Ricoh. Some Ricoh laser printers and multifunction laser printers emulate recent HP LaserJet models. See the first of the frequently-asked questions on this page for further information. Samsung. Many but not all of Samsung's recent laser printers emulate recent HP LaserJet models, and can be used with (for example) the HP LaserJet 1200 driver found elsewhere on this page; these HP-compatible printers include the Samsung ML-1250, ML-1450, ML-1650, ML-1651N, ML-1750, ML-2150, ML-2571, ML-2855, ML-3051, ML-4050, ML-4600, ML-5200A, ML-6060, QL-7050, QL-7050N, ML-7300N, and others introduced since this page was last updated. Note that some of these printers work only with a USB cables or network connections, not a traditional parallel cable, and therefore must be used with this site's techniques for printing to USB and network printers. (The Samsung QL-7050, QL-7050N, and ML-7300N models include a built-in duplexer, and may be used with the HP LaserJet 2200D driver found elsewhere on the page; these printers are compatible with both the HP LaserJet and with PostScript, and may also be used with any standard WPDOS PostScript drivers). Warning: Do not buy any of the low-priced Samsung laser printers models that are Windows-only printers and require this site's methods of printing to any Windows printer; these Windows-only printers include the Samsung ML-1210, ML-1630, ML-1665, ML-1710, ML-2240, ML-2510, ML-2525, ML-4500, and SF-5100P, and probably other models introduced since this page was last updated. Xerox: All Xerox laser printers may be used with WPDOS PostScript drivers; newer models, like the Phaser 850 and 860, may be used with the PostScript Level 3 drivers or the HP Color LaserJet drivers elsewhere on this page. Xerox inkjet printers probably require this site's methods of printing to any Windows printer. (1) Select a sheet feeder for your printer driver. Use Shift-F7/Select/Edit/Sheet Feeder, and choose an appropriate sheet feeder defintion from the list. (The abbreviation SF in each definition name means Sheet Feeder) If the name of one of the definitions is an exact match for the name of your printer, select it. If there is no exact match, choose a sheet feeder definition from the same "family" as your printer. That is, if you have an HP LaserJet 4250, choose the HP LaserJet 4000 (SF) definition. If the name of your printer does not match any on the list (for example, if you have an HP-compatible printer instead of a true HP printer), then you must experiment until you find a sheet feeder definition that works correctly with your printer. After highlighting a sheet feeder definition, choose Select, then write down the list of Bin numbers and corresponding trays that appears on your screen. In the next step, you will need to know which bin number in the sheet feeder definition corresponds to each actual paper tray on your printer. Press F7 until you return to the editing screen. (2) Create a page definition that uses a specific paper tray. Use Shift-F8/Page/Paper Size, and choose Add (Create). Choose a paper type from the list; if the paper that you want to specify does not match any of the names, choose 9-Other. On the next screen, make any adjustments that may be needed, and choose 5-Location. Very carefully, choose 2-Bin Number and specify one of the bin numbers that you wrote down in the preceding step. Press F7 until you are back at the editing screen. Test the definition by moving the cursor to the top of a document or a page. Use Shift-F8/Page/Paper Size-Type, choose Select, then press F7 until you return to the editing screen. Print the page. If it prints on a sheet of paper from your specified tray, then you have successfully created a paper size/type definition that works with a specific input tray. If the correct tray is not used, then you should return to step (1) and experiment with other sheet feeder definitions. If none of the sheet feeder definitions supplied with the drivers on this page work correctly, and if your printer is a true HP laser printer (not an HP-compatible printer from another manufacturer), please send me feedback, and I will try to fix my driver so that it works correctly with your HP printer. If your printer is not an HP printer, I may or may not be willing to try to create a sheet feeder definition for it, and I will charge you a consulting fee if I do succeed in creating a driver for your printer. A separate page on this site provides tools and instructions for installing Type 1 soft fonts in WPDOS PostScript drivers (as used in this site's methods for printing to any Windows printer and faxing to Windows fax software). The same page provides a utility for converting TrueType fonts to Type 1 fonts. Although not strictly a printer driver issue, the question is sometimes asked: how can I make a recent HP LaserJet print in a dark version of Courier font, like the one used in older LaserJets? If you have a LaserJet IIISi, any model in the LaserJet 4 series, or a LaserJet 5L or 6L, nothing can be done about the light Courier font unless you find a Courier soft font that you can install into WPDOS 5.1, or (for printers that accept font cartridges) you find a cartridge that includes a Courier bitmapped font. If you have a recent LaserJet model with an LED control panel, an option to set COURIER=DARK (instead of the default COURIER=REGULAR) is available on the Printing Menu (or some similar name). This solution works in the LaserJet 5, 5M, 5N, 2300 and later 2x00 series, and 4000 and all higher-numbered LaserJets. In the LaserJet 1200, 1220, and 3200 series , you can make make Dark Courier the printer's default font by following these instructions from HP's web site. Right-click on this link (darkcour.pjl) and choose "Save target as" or "Save link as." If you use Windows 95, 98, Me, or NT, when the Save As... dialog appears, click in the Save In... field near the top, and navigate up to the very top entry, which should be "Desktop"; if you use Windows 2000 or XP, navigate to a directory that you can easily find in a DOS prompt, perhaps the root (top) directory of drive C:. Click on the Save button and wait for the download to complete. If your printer is connected by a network connection or USB cable: You should already have installed one of this site's method of printing to USB and network printers. If you use the DOSPrint or Net Use method described on that page, make no change in the procedures described above. If, however, you use the PrintFile method, from the Windows Start menu, find PrintFile and run it (even if you already have PrintFile running). Drag the Darkcour.pjl file to the PrintFile window and drop it in the window. After a few seconds, close PrintFile. (or, for systems that use PrintFile, use PrintFile as explained above). Variations on this technique may be used to set other defaults for HP printers that lack a control panel. Full instructions may be found on HP's web site. In the printer drivers for most recent HP LaserJet models found elsewhere on this page the font named Courier (or CourierHP) will print as Dark Courier if this technique is used, but, if also present, the font named Courier PS (Courier PostScript) will print as the regular light Courier. If you want your WordPerfect printer driver to set the printer's internal Courier font temporarily to Dark Courier at the start of every print job, while leaving the printer's default setting at regular Courier, please contact me. WordPerfect for Unix 5.1 and 5.2, and character-based WordPerfect 6.x through 8.x for Unix, use the same printer drivers used by WordPefect for DOS 5.1. (Xwindows-based WordPerfect for Unix 6.x and later use WPDOS 6.x printer drivers.) These character-based versions should be able to use any of the driver files found on this page; you will need to expand the self-extracting files on a DOS or Windows system, then copy the extracted .ALL file to the directory that contains the printer drivers for your Unix installation of WordPerfect. Probably (I cannot confirm this) you must change the all-upper-case name of the DOS-based .ALL file to lower-case before attempting to use the file with the Unix version; for example, rename WP51HP4K.ALL to wp51hp4k.all. Help! How do I install these printer drivers? These step-by-step instructions are designed for non-technical users. If the download file is a ZIP archive, download it, open it in Windows Explorer, and move the .ALL file to your WPDOS printer file directory (which you can find in WP by using Shift-F1/Location of Files). If the downloaded file is a self-extracting .EXE file, then, for expert users, the only advice needed is this: download the self-extracting archive to a temporary or storage directory; run the self-extracting archive from a DOS prompt in order to extract the .ALL file; move the .ALL file to your printer file directory; select your new printer in WordPerfect. (1) Open WordPerfect 5.1; use Shift-F1/Location of Files; look at the Printer Files entry; and remember (perhaps write down) the name of the directory listed there. (2) Download the self-extracting file that contains the driver for your printer; either click on the link to the file or right-click on the link and choose Save target as... or Save link as... When the Save As dialog box appears (it will show the name of the file in the File Name field near the bottom and you will see a Save In... field at the top), click in the Save In... field, and use the directory tree to find the directory you identified in step (1). To navigate the directory tree, click the plus sign next to your drive letter to expand the tree, and navigate to the directory you want; you may have to click on more than one plus sign to find it. (This is easier to do than it is to describe.) Click Save to download the file. If you see a message asking if you want to overwrite an existing file, choose Yes. (4) A Windows Explorer window will open, with icons or filenames representing the files in the directory you specified. Find the name of the file that you downloaded. Even though the downloaded file has a name with ".exe" at the end, Windows Explorer (by default) does not display the letters ".exe". So if the file you downloaded was named "Wp51hp4k.exe" look for "Wp51hp4k" in the directory list. If your system does display the ".exe" at the end of the name, that is perfectly all right also. Note: You will make your life much easier if you change your windows settings to display letters like ".exe"; full instructions may be found elsewhere on this site. (5) Double-click on that file. With most Windows versions, you may see a message box that asks if you want to Run the file; if you see this message box, click on Run; you will then see a DOS window open briefly and then close; that is exactly what should happen; proceed to step (6). If you receive a prompt asking if you want to overwrite an existing file, answer Yes. Note: If you are installing a printer driver downloaded from Corel's web site, instead of a driver file downloaded from this site, you will be prompted to extract the driver files; answer Yes to the prompt. (6) Close the window that you opened in step (4). (7) Run WordPerfect. Use Shift-F7/Select/Additional Printers. Scroll down the list until you find the name of the printer you want to install. If you find two similar entries, one with (PCL) in the name, the other with (PS) or (PostScript), choose the (PCL) definition unless you have a good reason not to do so. Choose Select. Press Enter to accept the default printer filename. Press F7 until you are back at the Select Printer: Edit menu; if your printer has more than one input tray, use the Sheet Feeder menu item to select the sheet feeder definition for your printer. Press F7 until you are back at the editing screen. Print a file to make certain that everything works. If you encounter any problems, use this site's advice on troubleshooting printing under Windows.